I became a fan of King Arthur Flour a couple of years ago, thanks to my friend, Steve – the bread-man. 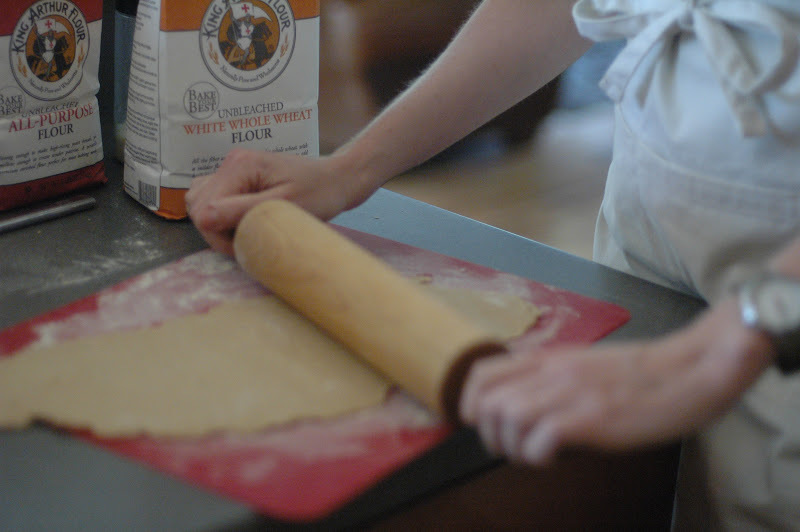 This company produces great flour and a very useful website, filled with beautiful recipes. So, when I saw online that they have published a cookbook, I was excited to get it. I put it on my wish list and my sister and mom ordered it for me for my birthday. When it arrived, I was quite surprised. It is HUGE. It’s Joy-of-Cooking-huge – a manual for baking! I wasn’t expecting such a large, reference style cookbook. It’s a little intimidating and will take some time to get acclimated to it. I am very excited–now that classes are over and summer is on the horizon–that I will be able to use it as a textbook for baking this summer. It’s on my “summer reading list”, along with 20 or so other books. I am fully aware that a summer book list of this length is impossible to accomplish with 3 kids at home all summer. 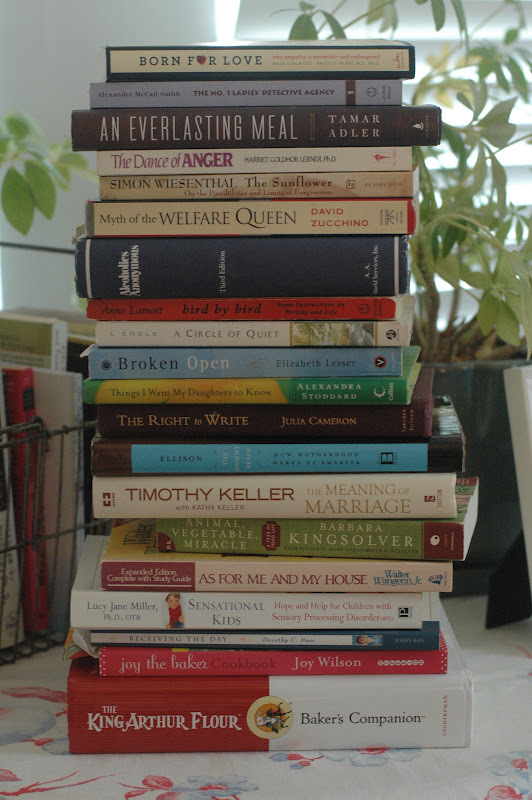 However, I am determined to make a dent in my stack and make this a reading-filled summer! My reading list is filled with books that I have been accumulating and stacking around my house, in hopes of getting to read them at some point. Now it’s time to get focused on making it happen. I see this as marathon of reading. I cannot imagine running 13-ish miles (the ½ marathon, which many people I know just did), and I certainly can’t imagine running the full marathon – 26-ish miles (which a few of my friends did). This seems an impossibility. I cannot imagine the months of training leading up to this event, with all of the sacrifice and energy day in and day out! Furthermore, the idea of doing this ALONE sounds impossible and miserable. I have found that even my marathon-running friends deem going it alone to be absurd. How could you train for this, week after week without the companionship and camaraderie of partners? So, I am thinking I want to attempt a READING MARATHON (okay, ½ marathon maybe). And I’m beginning to think partnership would greatly enhance the experience and increase the likelihood of me completing this. Not to mention a whole lot more fun. Speaking of camaraderie, I have recently called on my cooking lab pals to help me redeem my failed attempt at homemade crackers. A couple of months ago, I cracked open my King Arthur Baker’s Companion to give a recipe a try (knowing I would have to wait until summer to study the book). I decided to start with Crackers. They seemed quick and basic. The recipe is very fluid and loose, which is nice if you are craving creative license, and torture if you are wanting a clear and guaranteed successful recipe. I made a batch to serve with homemade chicken noodle soup. They were a little mediocre and my family responded with, “Really? Why did you make crackers, Mom?” I then proceeded to eat them and they nibbled on them a bit. It was discouraging and felt pretty much like a failure. 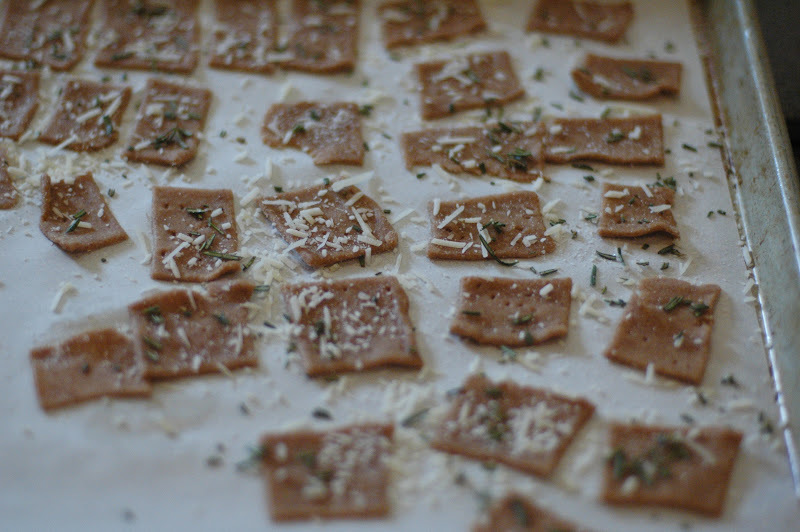 So, I started looking around on Pinterest to see what cracker recipes I could find and discovered 3 recipes for crackers that looked especially tasty. That’s when I called in my reinforcements. Friends are what embolden me to experiment with something that feels beyond me. (Kind of like running multiple miles every Saturday morning – for some people). 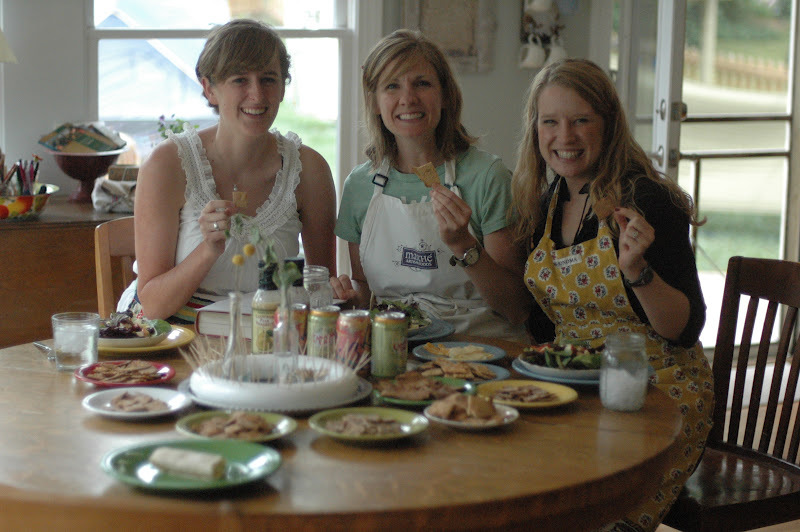 I asked Blair and Caroline, my poached egg cooking partners, to join me in a cooking lab for crackers. And it was a success! We looked at the 3 recipes and decided on two that looked especially good to us. We then decided to make double batches of those two so that we could try different seasonings. 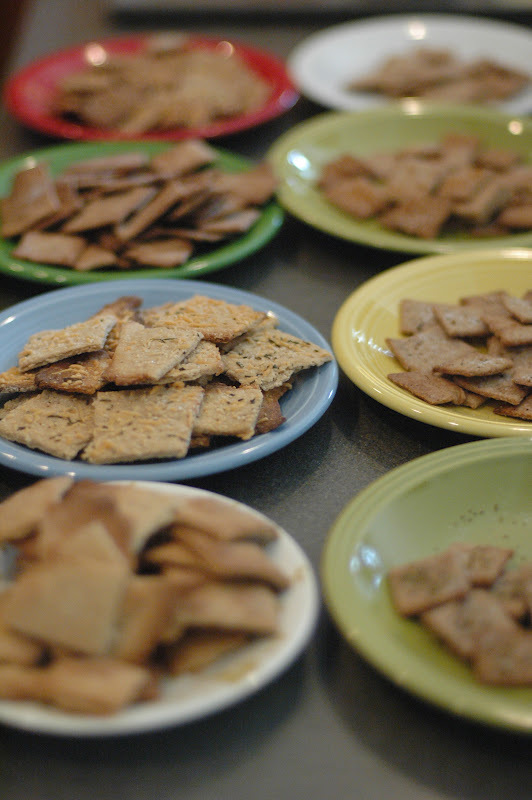 We made “saltine-like” crackers and “wheat thin-like” crackers. We all voted on the wheat thins as the winners. They are very simple to make and are delicious! We all decided we liked the Wheat ones the best and there was a varied response on the favorite flavor: garlic/kosher salt was my family’s favorite and the rosemary/parmesan/kosher salt were the lab team’s favorite. *Thin-ness is crucial. 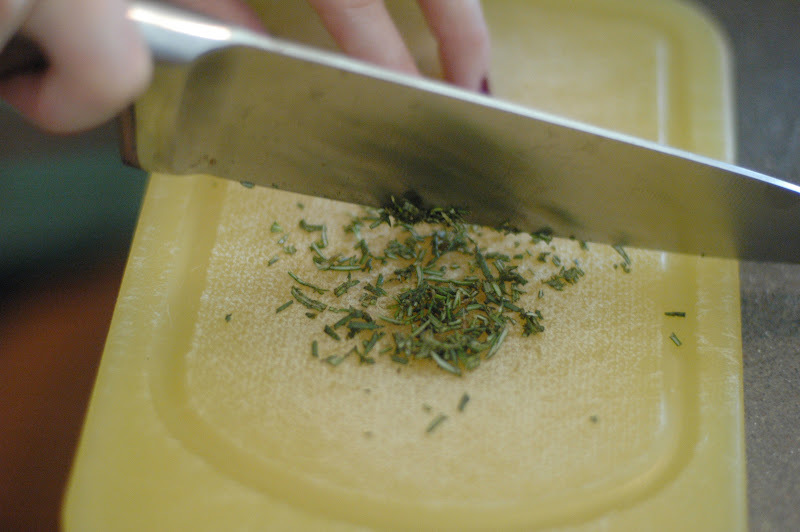 You need to roll them really thin. *Prick the dough with a fork, to prevent them from puffing up. *Transfer dough to the baking sheet (or stone) before adding toppings, as the toppings might fall off during the transfer, if moved with the toppings (we learned this the hard way). 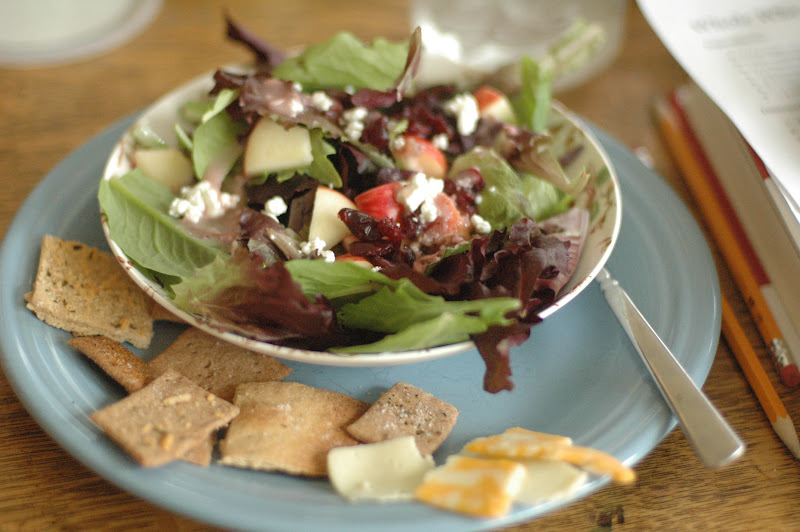 When we had our taste test, I threw together a fruit and goat cheese studded green salad to have with our piles of crackers, and my family joined us. Dave asked, “now WHY would you go to the trouble to MAKE crackers? Is this for fun or is it a whole lot cheaper?” I stumbled around with my answer, explaining that they were fresh, without preservatives, varied in flavors, and cheap to make. He didn’t seem convinced. I then said, “…and it is my hobby, so it’s fun.” That answer seemed to make more sense to him. 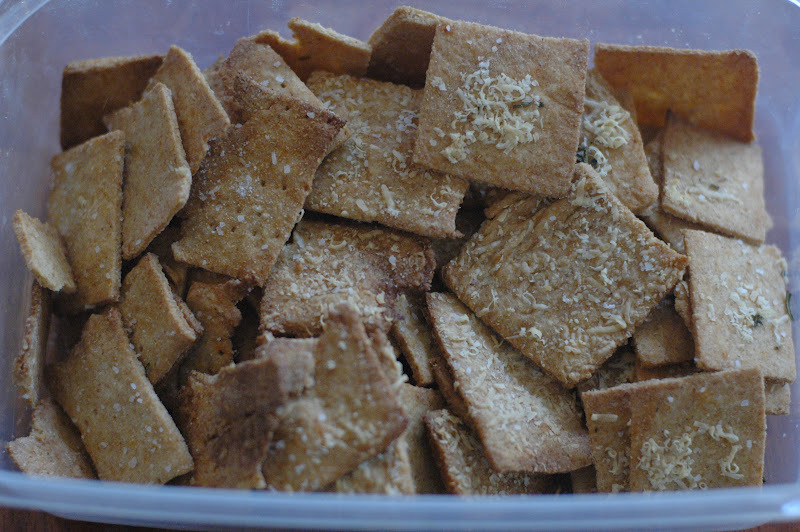 After tasting them though, he agreed that it was a good idea to make homemade crackers, as these are super yummy! 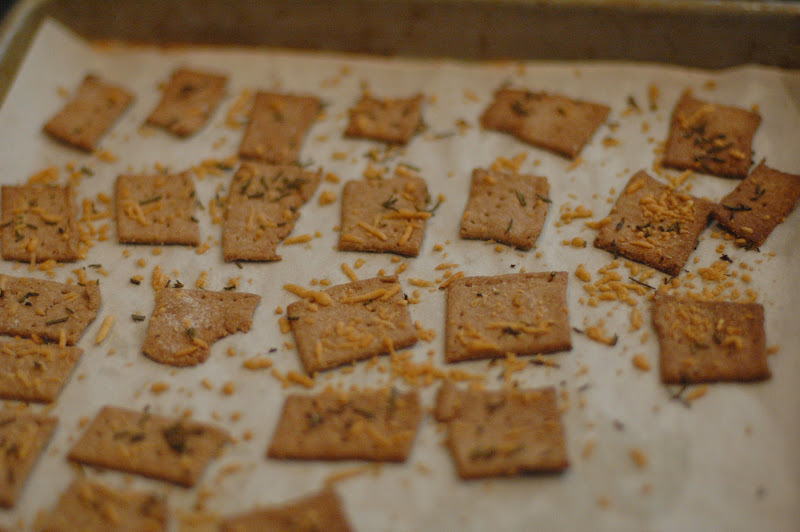 I think the idea of my homemade cracker-making began when I was a young girl and went to Darrell’s restaurant. Did you ever go to that bizarre restaurant that had a bus and a jail and an elevator in it? They served free form homemade crackers as an appetizer. They were salty and buttery and memorable… clearly! Preheat oven to 400 degrees. Line two baking sheets with parchment paper (or use baking stones). 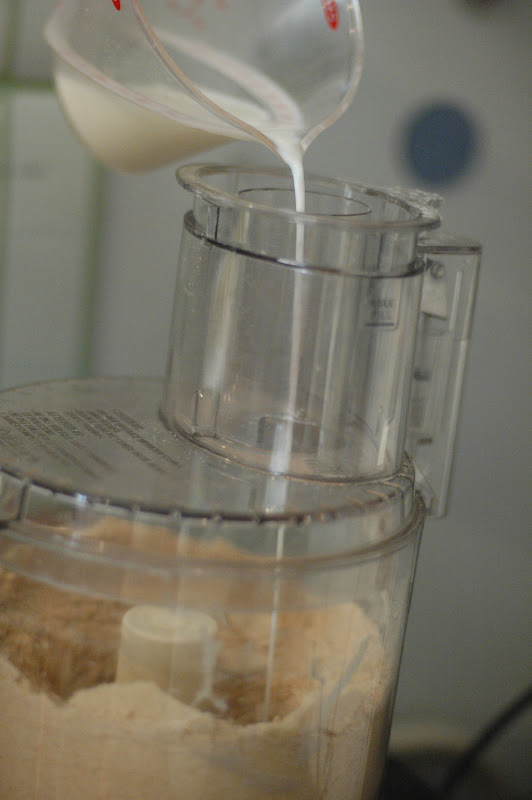 In food processor, combine flour, sugar, salt, paprika, and butter. Pulse until the mixture is crumbly. Add water and vanilla and pulse again until evenly combined. Form dough into ball and divide in half. Roll out as thin as possible. Using a pizza cutter or good knife, cut into squares. Italian seasonings, garlic powder, etc. Find a friend or two to join you in running a race, reading some books, making some crackers, or any pursuit that sounds more do-able and fun when done together. Oh of course you made crackers Julie! How fun!! And if Dave didn't get it, I do. Fresh, fun, and festive. Thanks for yet another good recipe. I would read a book with you, Julie! It looks like there are a couple on your stack that I planned on reading. Jana, I'm glad YOU get it! Try them. They are so great, and since you have several eaters in your home – I recommend doubling the recipe. The effort to make more is not much at all when you are already into the process. The kids might like to help too and get creative on seasonings! I hope you are well. And Leigh, thank you for so faithfully reading and giving feedback. Yes, let's have coffee and discuss a book. Which ones are you thinking? Let me know! eek! let me know what books you end up reading. i may read them with you, from afar, of course. i too, am looking to my first summer in a long while where i will have work, yes (well, hopefully) but nothing else! a world without homework! pleasure reading! i can't wait! Amy! I can't believe it!! Congratulations !! Yes, let's read.,, let me know what looks appealing to you- we'll Skype! julie – we continue to love your blog…your salsa is now a family favorite! Would love to read a book…maybe we could chat when you visit your mom! !